You may recall that this 2014–2015 academic year marks The New Century School‘s 5th anniversary both as TNCS and in its current location. Another meaningful anniversary goes hand in hand with TNCS’s milestone—this is Immersed‘s 100th blog post! For each of the past 99 weeks, Immersed has kept you abreast of TNCS goings-on, relevant education news, and other pertinent tidbits. We thank you for your readership and invite you to suggest blog topics you are interested in reading about. This centenarian is here for you and going strong! Long may you run, Immersed! Kuàilè de bǎi fēn zhī yī suì shēngrì (快乐的百分之一 百岁生日)! Always follow the green for TNCS events! 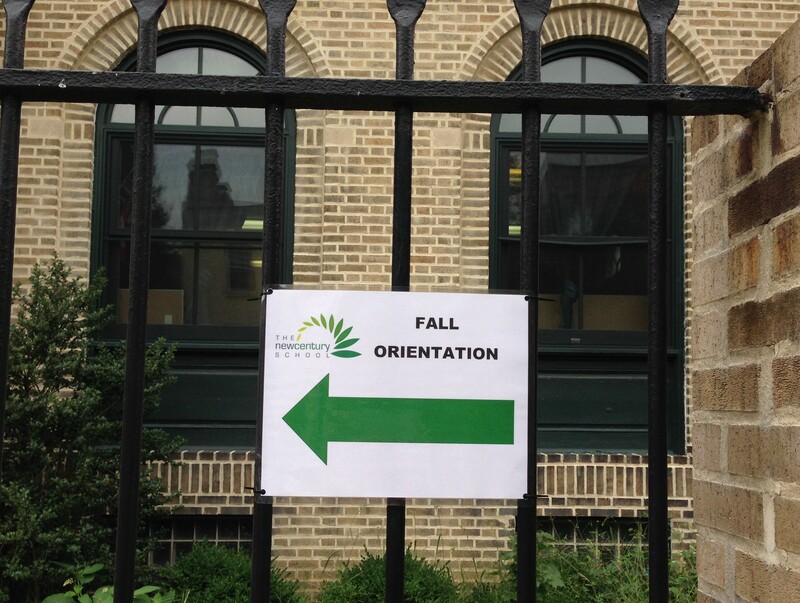 On Friday, August 22nd, The New Century School hosted a very special Back-to-School Orientation/Open House—this event marked the beginning of TNCS’s 5th year in its 724 South Ann St. location! During each of those marvelous 5 years, the school has grow, adapted, and blossomed into what it is today, an educational environment where each child is nurtured, challenged, and celebrated. This is no small achievement, and the 2014–2015 academic year promises to be the best yet. Exciting and important changes are afoot, each moving progressive, multilingual, independent TNCS forward. Families who attended the Open House learned of many of these changes during the event while they met teachers and explored school grounds, got to know each other or caught up from summer break, and enjoyed some of Chef Emma’s tasty refreshments. For those of you were unable to attend, read on to learn what this school year holds in store! Although we bade farewell to a few instructors at the end of last semester, their contributions to the TNCS community will not be forgotten, and they will always remain part of the TNCS family. With great joy, we also welcome some new members to the caring, talented, all-around amazing TNCS staff. Robert Bekas (Elementary Physical Education Teacher): Mr. Bekas was born and raised in Poland, where he graduated from The Academy of Physical Education in Warsaw with a Master of Arts degree in Physical Education/Sport Science. During college, Mr. Bekas specialized in strength training, fitness, and martial arts. In 2004, he moved to the United States and began teaching PE to local private schools. His other hobbies include teaching martial arts. He holds black belts in karate, taekwondo, and kickboxing. Teresa Jacoby (Kindergarten/1st-Grade General Studies Teacher): Mrs. Jacoby holds a Master’s Degree as a Reading Specialist from Loyola University in Maryland and a Bachelor of Science in Elementary Education and Special Education with an Art Education Minor from Northern Arizona University in Flagstaff. She also has an Advanced Professional Certificate Special Education 1–12 and an Advanced Professional Certificate Reading Specialist Certification, both from the state of Maryland. She has taught a wide variety of students ranging from Kindergarten through 8th grade Special Education in all content areas in both self-contained and inclusion environments. She also has run many extracurricular activities from chairing the Science Fair to Chess Club to Lego Robotics Club. She lives in Baltimore and enjoys using her artistic skills in and out of the classroom, gardening, riding bikes, and spending time with her family. Jie Liang (Mandarin Primary & Elementary Assistant): Ms. Liang holds a Master’s Degree in Secondary Education for Chinese Language from Towson University, and a Bachelor of Arts degree in German Language and Literature from the University of China. Ms. Liang has facilitated Startalk programs in Vermont and was an immersion teacher for the Confucius Institute in Nuremberg, Germany. She has taught kindergarten at the Baltimore Chinese School and interned at Perry Hall High School teaching advanced-level Chinese classes. She was a Lead Teacher in TNCS’s inaugural and highly successful Summer Startalk program in Summer 2014. Dan McDonigal (STEM Teacher Grades 2–4): Mr. McGonigal grew up in Pennsylvania and attended Bloomsburg University, where he received a Bachelor of Arts degree in Communications, specializing in Journalism. Mr. McGonigal worked professionally for 8 years with a market research company prior to changing his career to education. In 2006 he earned his Master’s Degree in Education from Notre Dame of Maryland University. He has 7 years’ teaching experience in Harford and Baltimore Counties. He is currently working toward a STEM (science, technology, engineering, and math) certification through a Cohort with Towson University. He is passionate about bringing STEM-related learning experiences to the students of TNCS. Mr. McGonigal is married and the father of two young boys. He enjoys sports, working on home improvement projects, and spending time outdoors. He also enjoys traveling, especially his trips to Italy and Ireland. Maria Mosby (Montessori Lead Teacher): Montessori has felt like home for Ms. Mosby for quite some time. She began at age 2 ½ years at Columbia Montessori School, in Columbia, MD. After several moves with her family throughout New England and the Washington, D.C. area, she rediscovered Montessori while studying Early Childhood Education at Towson University. Ms. Mosby was a primary assistant for 3 years, and a toddler assistant for 5 years at Greenspring Montessori School (formerly, The Montessori School), where she decided to take her Early Childhood training through the Maryland Center for Montessori Studies. During her internship, she worked at The New Century School summer camp and loved the warm, peaceful community. In her free time, Maria enjoys running, making crafts, studying foreign languages, and yoga. She is also a certified children’s yoga instructor and will complete her 200-hour yoga training in 2015. As we welcome these new members to TNCS, we also congratulate current staff members on continuing the wonderful work they do so well and with such big hearts. Some are adopting new roles, including Cassidy Bryson, who will work in the Primary group to support language immersion; Jennifer Hodapp, who will lead Elementary Spanish classes and assume directorship of Spanish school-wide; and Yurisan Gonzalez, who will be moving to the Pre-Primary Spanish immersion class. For the first time, TNCS and Coppermine at Du Burns Arena at 3100 Boston St. are partnering to offer exciting afterschool athletic programs to TNCS students, including transportation to the facility! The Fall session runs September 9–November 13, 2014 and is available to students ages 5–10 years old. Choose from Flag Football on Tuesdays, Lacrosse on Wednesdays, or All-Star Sports on Thursdays. Younger students can participate in Coppermine Soccer on premises at TNCS on Tuesdays. Direct your questions about the programs and enrollment to Coach Mark (mark@copperminefieldhouse.com). It bears repeating—TNCS is 5 years old and going strong! Previously Patterson Park Montessori, a one-room preschool that opened in 2007, the growing school moved in the Summer of 2010 to Fell’s Point and was renamed The New Century School to gradually add a K–8th grade program to the preschool. Founders, Co-Executive Directors, and Baltimore City residents Roberta Faux and Jennifer Lawner have succeeded in creating a very special school with progressive academic programming that allows students to thrive at their own unique skill and ability levels. The elementary program at TNCS started in Fall, 2010 with only a handful of kindergartners but has now expanded to include three elementary classes through 4th grade and will continue to add a grade each year to accommodate the maturing student body through the 8th grade. It’s a glorious prospect! TNCS looks forward to seeing you bright and early for class on Monday, August 25th, 2014, and we greatly anticipate assisting each child to make huge personal and intellectual strides this school year! 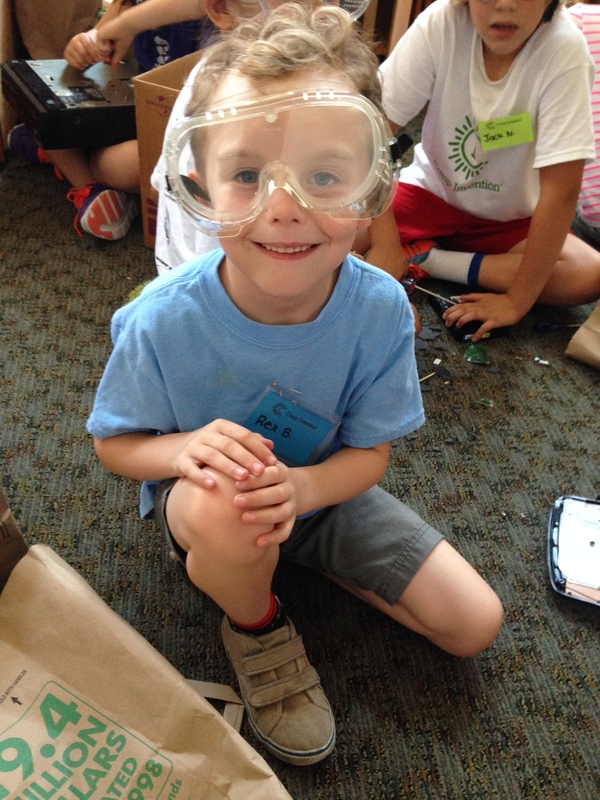 Camp Invention Takes Creativity to New Heights (and New Depths) at TNCS! 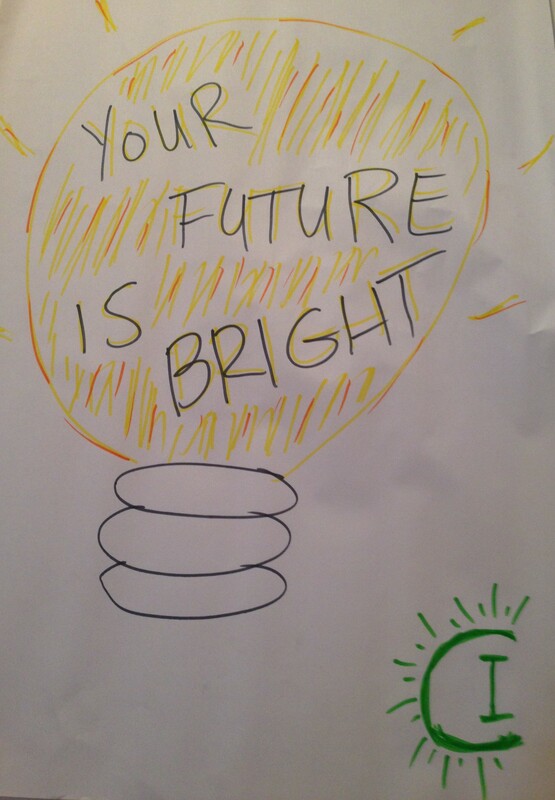 A hand-drawn Camp Invention logo and motto inspires TNCS inventors. Over a clamor of hammering, chatter, whirring, and buzzing, a shout is heard—“What’s our number one rule?” “Have fun!” is the enthusiastic reply of a dozen or so 1st-grade voices. For the third summer running, The New Century School hosted Camp Invention, a week-long day program and the brainchild of the National Inventors Hall of Fame in partnership with the United States Patent and Trademark Office. Presenting kids with real-world challenges that encourage them to solve problems and present their solutions through themed, scientific, engaging hands-on investigation, the Camp Invention program integrates four key components: 1) STEM enrichment, 2) consistent and effective implementation, 3) collaboration and other 21st-century skills, and 4) teacher and student development (read details here). TNCS Kindergarten/1st-Grade teacher Teresa Jacoby headed up the program as Camp Director, joined by Camp Instructors Miss Danielle, Miss Fanta, Miss Katie, and Miss Sarah, who are public school teachers in various subjects during the school year. “I really enjoyed this program,” said Mrs. Jacoby, “because it’s very thorough, and everything is broken down into steps.” A science enthusiast in her own right, she plans to use some of the Camp Invention approach in her classroom. The thematic aspect, she says, shows students where a particular lesson is heading and what it all leads up to. 1. 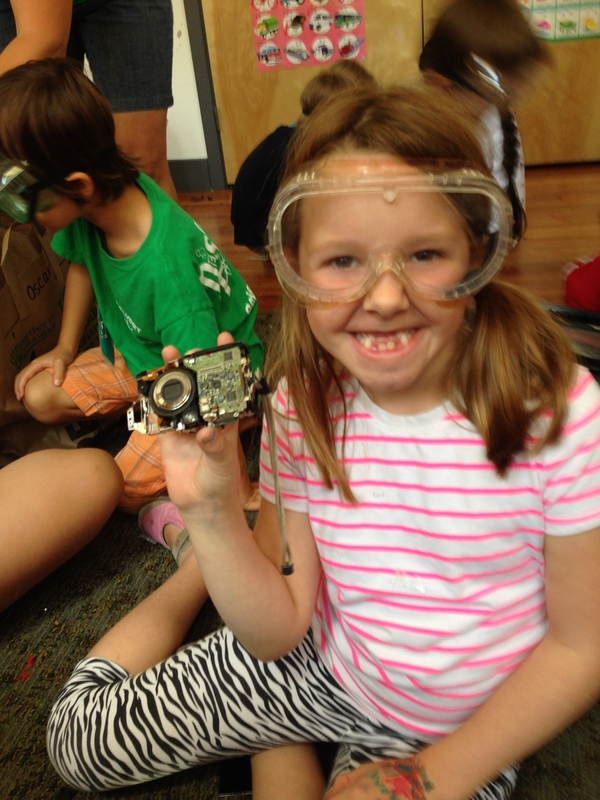 Amplified: Kids explored the dynamic realm of the five senses on a bionic adventure. They joined “research teams” and unlocked clues to uncover nature’s blueprints (i.e., animal evolutionary adaptations), which hold the key to superhuman senses. To build essential STEM skills, they developed bionic gadgets and explored sensory illusions. Campers explored how the rubber band motion of the hand worked and predicted how many times they would be able to accurately hit a target with it. “Sight tells us one thing but we also have to touch it,” said Mrs. Jacoby. We use our different senses together to accrue data and confirm or modify our original hypothesis. Campers put one hand in hot water and one in cold, then put each hand in the warm, which felt hot to the cold hand and cold to the hot. Campers recorded observations as well as drawings of their invention prototypes in daily journals. Animals use a variety of means for mobility, which campers explored to incorporate into their own research and eventual invention prototypes. All part of the research to create supersenses and bionics! Ears are an important evolutionary adaptation and were key to the amplified module. 2. Super Go: Kids created morphing, motor-powered vehicles that operate on land, in the air, and underwater. Using nature’s designs, they explored energy, fuel, movement, and animal features and then applied these discoveries to motor-powered vehicles. In preparation for the Super Go Road Rally, they used their STEM skills to build their vehicles, ramps, and tunnels and let ’em rip! Even starfish self-propel themselves . . .using hydraulics! These vehicle prerequisites are pretty stringent! Wow! What kind of fuel(s) will your vehicle use? This super go vehicle uses rubber band motion to move, as the inventor researched in the amplified module. Each inventor’s prototype vehicle was stored in labeled plastic bags for safekeeping and easy identification! This journal drawing represents the direction one inventor plans to take to allow her vehicle to “swim” out of water onto land . . . like an amphibian! A gaggle of Super Gos! 3. 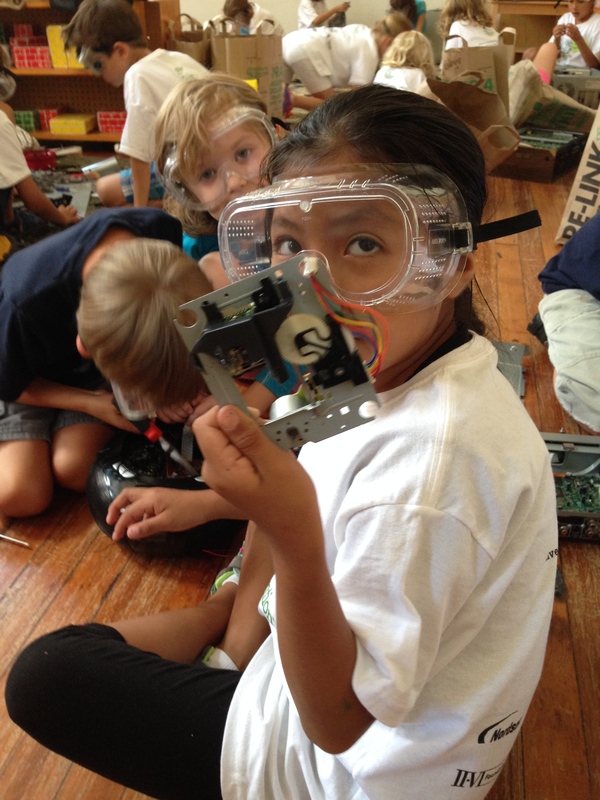 I Can Invent: Pinbug: Kids disassembled electronics to build insect-themed pinball machines. They used tools to uncover mechanical guts and upcycle them into bumpers, targets, and scoreboards. Then they used physics, anatomy, and math to propel ping-pong balls onto the playfield with a cardboard launcher and insect leg flippers. Mrs. Jacoby helps a member of Team Rollie Pollie strengthen their pinbug machine casing. Team Rollie Pollie from the orange group collaborated on a pinbug machine. Campers were not permitted to work with any kind of tools unless they had donned their goggles. Safety first! Miss Fanta guides a team in constructing their pinbug machine. Where do all of the resources come from to create all of the amazing inventions? Recycled materials! Camp Instructors Miss Katie (left) and Miss Sarah (right) help the 1st-grade campers with some of the more arduous cardboard cutting, but constructing the pinbug machines will be all done by the campers themselves. This pinbug machine is really coming together! Various parts from a disassembled alarm clock and a disassembled keyboard will find new life as components of a pinbug machine! 4. Design Studio: Morphed! : Kids invented and tinkered with circuits and design solutions to nature-based challenges. As entrepreneurs, team leaders, and designers, they worked alongside other campers to bring their inventions “to market” in an environment modeled after real-world research and development. In this case, magic markers are the mother of invention. Some drawings of what promise to be some pretty fantastic inventions one day . . .
A money machine would definitely improve the lives of many! These recycled materials will actually be “upcycled”—that is, they will become something altogether new. Balloons, beads, pipe cleaners—oh my! Using tools is so much fun! Mrs. Jacoby thoroughly enjoyed teaching the camp she says because she was impressed with how much the kids actually used tools to figure things out and to create, fix, and experiment. She also appreciated the number of girls participating; the ratio of girls to boys was equal. “There’s not a girl in here who’s going to be afraid to change her own light fixtures,” she said. TNCS Knows Safe Urban Gardening! The greenhouse is a magical place for TNCS students, full of wonder and possibility. 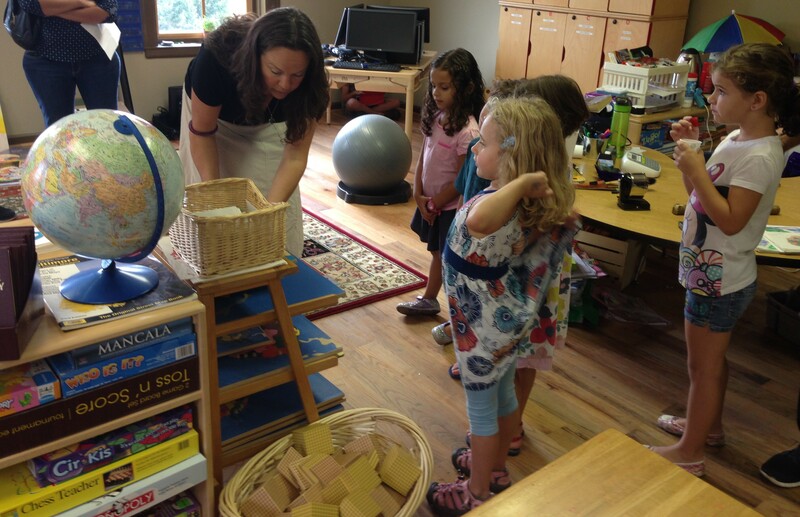 When then-prospective parent Lori Rosman contacted The New Century School this past Spring about enrolling her son in the pre-primary program, one of her first questions was about TNCS’s on-premise greenhouse. “I was excited that TNCS has a garden and is growing some of their own food,” she said. “Our son is very curious about cooking and always asks, ‘what are the ingredients?’ in everything.” Ms. Rosman also happens to be a Public Health Informationist at Johns Hopkins University, where an article about urban gardening had recently circulated. The article warned about some potential health risks of unsafe urban gardening methods, such as using contaminated soil. City soil can contain unsafe lead and asbestos levels, for example, especially in areas where construction or demolition has been going on. Urban gardening can be perfectly safe, but the gardener needs to take certain precautions, which novice gardeners might be unaware of. And the number of urban gardeners in the United States is steadily growing—up 29% in the last 5 years from 7 million to 9 million people, according to the National Gardening Association, so this information comes none too soon. “I felt an obligation to educate myself,” said Ms. Rosman, so she approached TNCS Admissions Director Robin Munro with her questions. “I appreciated that Robin took my questions seriously and suggested going to talk to Chef Emma [Novashinski] about my concerns.” Chef Emma was well aware of the issue, and, together, the three discussed the safe practices she uses. “It was very reassuring!” said Ms. Rosman. Cantaloupe peeking out from its nest of greenery. This gorgeous sunflower (grown from last year’s sunflower seeds), extends a petal in greeting. The grapes turned out surprisingly sweet, so Chef Emma will turn them into jelly! 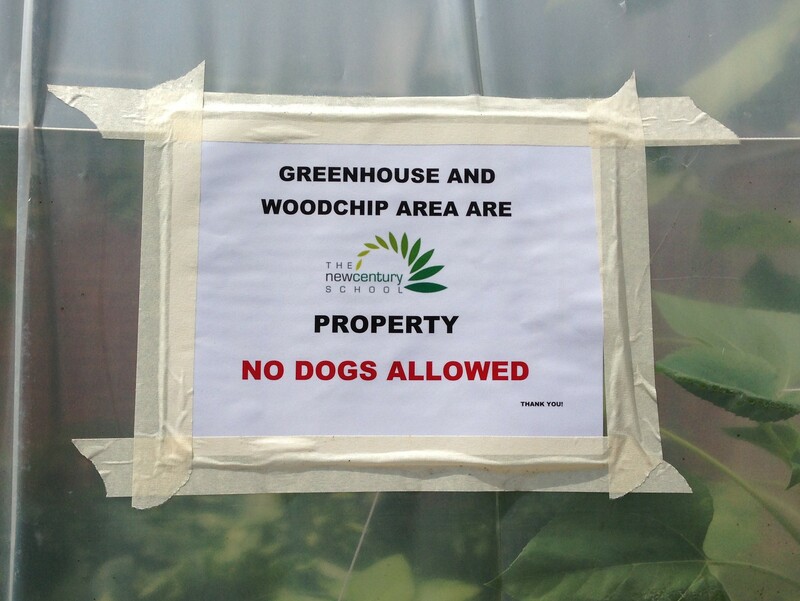 For obvious reasons, please keep the four-legged friends out of the greenhouse :)! TNCS Master Gardener and Executive Chef Emma Novashinski was aware of the site’s history, which is the first step for planning an urban garden safe for food-growing, according to a guide by Johns Hopkins Center for a Livable Future on soil safety. The Center also provides interactive maps of Baltimore food gardens and other resources. 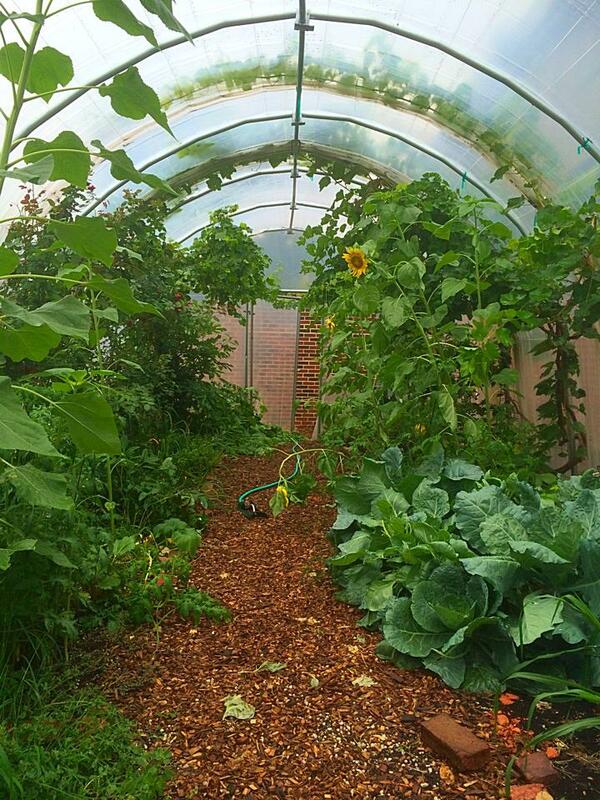 As luck would have it, Chef Emma selected the location for TNCS’s greenhouse on the very spot a large community garden had recently occupied. Those savvy gardeners employed regular composting and wood-chipping to keep their soil healthy as well as annually replenished it. In a case of very good timing, Chef was due to test the soil for the coming 2014–2015 academic year. 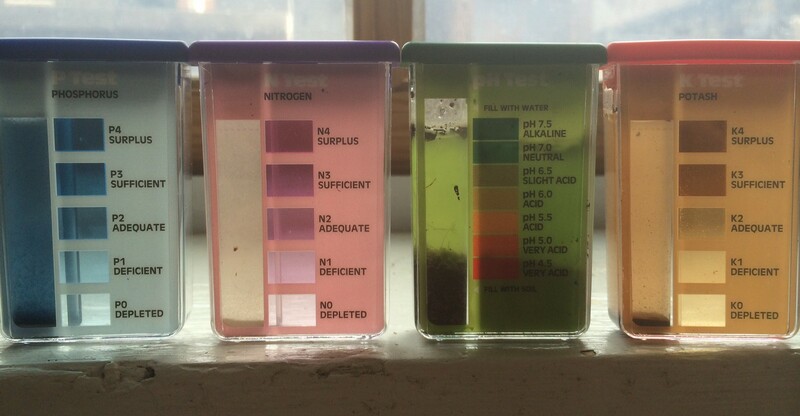 On Friday, 8/8/14, she reported: “We are sufficient in all levels except nitrogen, so we will be incorporating blood meal [an organic fertilizer] and nitrate of soda into the soil to remedy this nutrient deficiency, which was probably caused by watering and rainfall.” All fine! The potential health, social, environmental, and economic benefits of urban farms and gardens are far-reaching. For example, studies have found associations between urban community gardens and increased access to healthy food, opportunities for exercise, stronger social cohesion in neighborhoods, and higher property values. And like any green space, urban farms and gardens offer essential ecosystem services like moderating temperatures and reducing storm water runoff. And, TNCS is feeding students hands down the best homemade, locally sourced lunch around as a direct result of the greenhouse and other nearby gardens and farms. So let’s keep this wonderful—and safe when done right—practice going and growing! Faux chicken and beef kebabs with local onions, peppers, and tomatoes; local lettuce, wax bean, cucumber and feta salad; sun chips; and local blueberries. Washed down with milk. Homemade falafel in a whole wheat pita, with local lettuce and tomato and homemade tahini dressing; local blueberries; homemade granola; homemade tofu and blueberry custard; and dehydrated beetroot chips. Welcome to TNCS’s 2014–2015 academic year, Rosman family, and thanks for suggesting this extremely worthwhile topic for Immersed! Cooking and Gardening Camp at TNCS Is a Recipe for Fun! Mrs. Reynolds’ and Mrs. Lazarony’s campers joined forces for the Teddy Bear Picnic. What do you get when you group together about a dozen 2- to 4-year-olds and teach them to grow produce that they can turn into lunch? “Cuteness overload.” At least that’s how camp teachers Angela Lazarony and Lisa Reynolds describe it. The second installment of Cooking and Gardening camp at The New Century School started the last week of July and continues through the second week of August. This one is led by Mrs. Reynolds with TNCS Spanish teacher Yurisan Gonzalez assisting. Campers spend most of the morning outside, usually in TNCS’s on-premise greenhouse. They learn to cultivate vegetables and fruit, and they also create recipes with the ingredients they harvest. All in all, they are learning about healthy eating habits while enjoying getting their hands dirty! Week 1 culminated with a Teddy Bear Picnic (hence the aforementioned cuteness overload). For the picnic, Mrs. Reynolds’ and Mrs. Lazarony’s campers joined forces, and there was a perfect riot of plush animals also in attendance. Picnic fare consisted of a bounty of fruits, a salad, and veggie sandwiches. As a special contribution, Mrs. Reynolds’ campers concocted a salad dressing, mostly from greenhouse ingredients. Who came up with recipe? They did. “It’s a little on the sweet side,” said Mrs. Reynolds, “but actually pretty good!” Peppermint, vinegar, sugar, lemon, oil, bananas (! ), etc. all went into the blender and out came a lovely green emulsion. The kids did a taste test to make sure their dressing was suitable for sharing. Campers made peppermint banana dressing, a recipe of their own devising! This delicious, healthy salad awaits its homemade dressing! Picnickers at the Teddy Bear Picnic. After eating their snacks, games and crafts closed out the Teddy Bear Picnic. Campers raced with (toy) eggs in wooden spoons, made parachutes for their plushies, and played other field day–type games. Everyone was awarded a blue ribbon. Using artichokes as stamps, they also painted flowers. Clever! With Cooking and Gardening Camp off to such a great start, Week 2 promises to continue growing the fun!